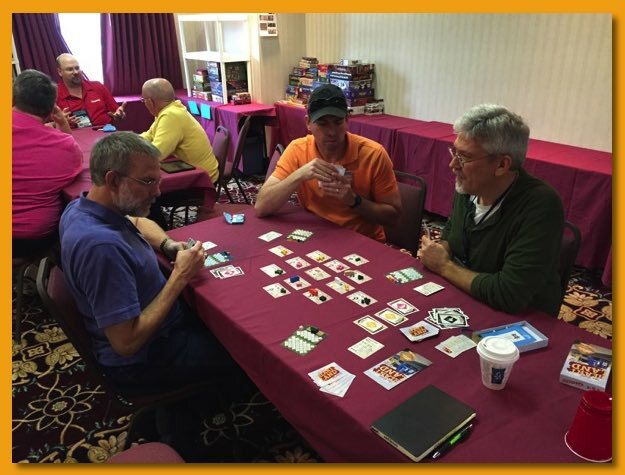 Great Lakes Games 13 (2015) is in the bag. Luckily, the convention takes place only a short three hour car trip away and, strangely enough, in a small rural town within 10 miles of where I grew up in northeastern Indiana. I’m very familiar with the area and it feels a little like going home. This is my seventh year attending and seeing so many of the same people from year to year it really does feel like home. There were a handful of regulars that couldn’t make it and they were sorely missed. I hope that this was a one-time issue and that they’ll be able to make it next year. 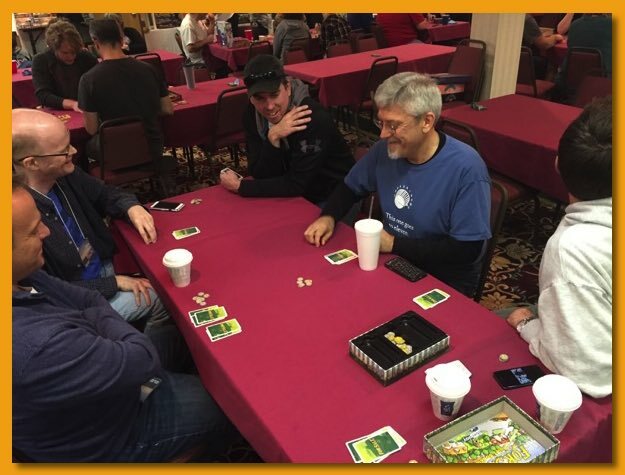 Over the last few years I’ve lobbied to get four members of my game group invited and this year was a real treat as all four of us could make it. Having someone to discuss the anticipation of playing specific games, comparing notes, etc. on the drive over and then having someone to help decompress and make that transition back to real life on the return trip really makes for an enjoyable experience. 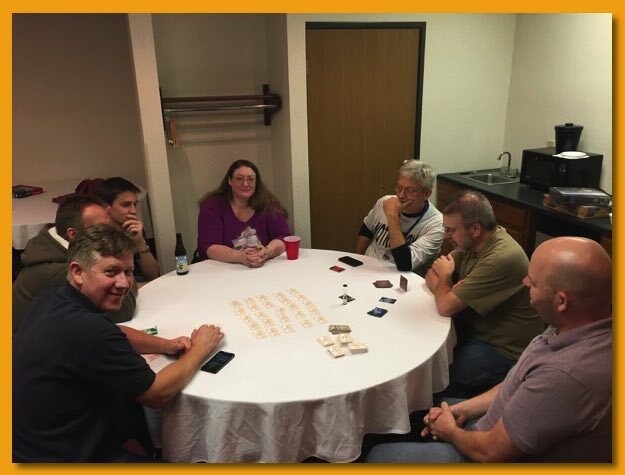 Like my group’s yearly “cabin con”, it provides a great opportunity for us to bond as a group, with others, and provides a back-drop for growing individually as a person and a friend. I wouldn’t miss it for the world. Here are some stats and spread throughout, I’ve included brief comments where I felt there was something interesting to share. And so it begins. 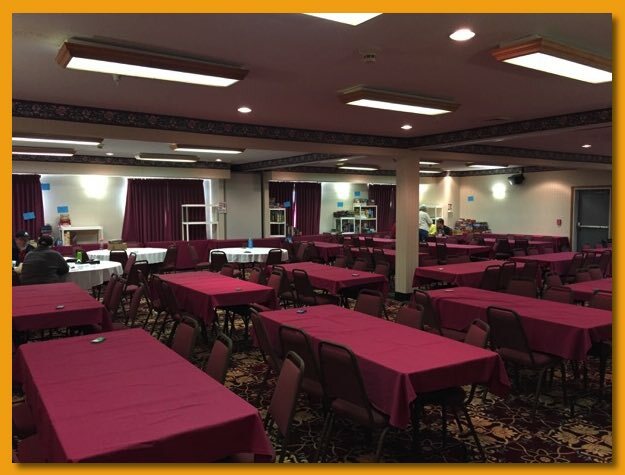 We arrived early on Thursday afternoon before most people got there but there were a couple of tables already housing some of the really early gamers. 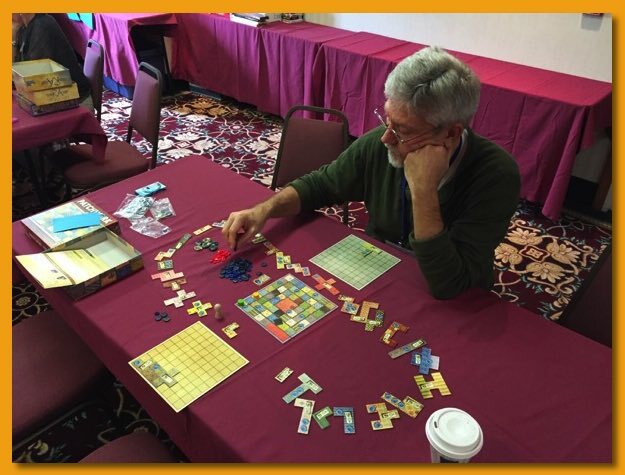 Early on its a little hard to get a larger group so my driving partner and I pulled out Patchwork, a very enjoyable two-player puzzle-game with a fun theme. What a nice game packed in that little box. I’ve pimped out the game a bit with real buttons to use as coins to jazz it up a bit. 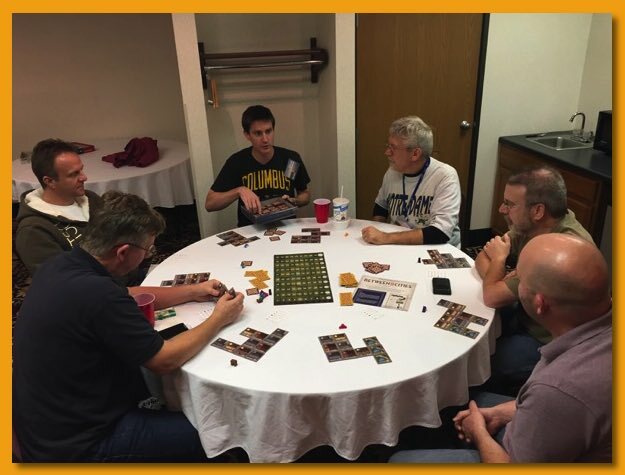 By the time we finished up Patchwork we were able to pull in a third to play Roll For the Galaxy one of my favorite dice rolling games. There’s an expansion available but I’m torn whether to get it since I like the game as is and more rules and bits don’t necessarily make a game funner. 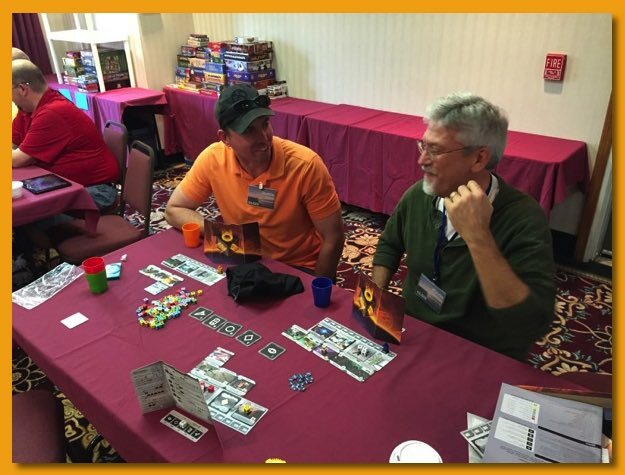 Another attendee had just bought of copy of The Great Heartland Hauling Company and hadn’t played it yet so he joined us as a fourth and we taught it. 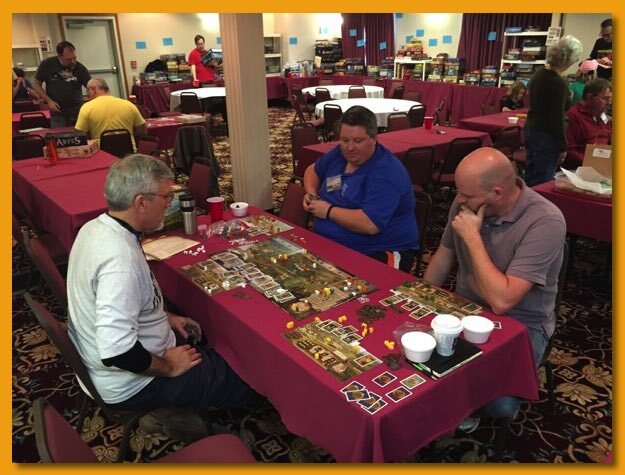 That’s another great thing about GLG is that there are usually people available and willing to teach a game to a group. 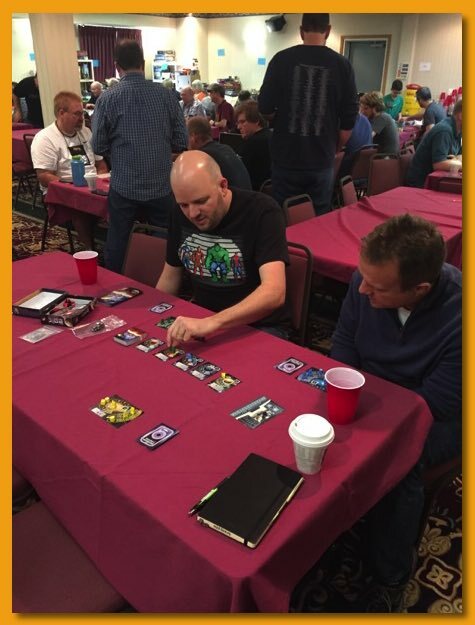 Whenever I see a group reading rules to a game I know I try to make the time to ask if they want someone to get them up to speed. 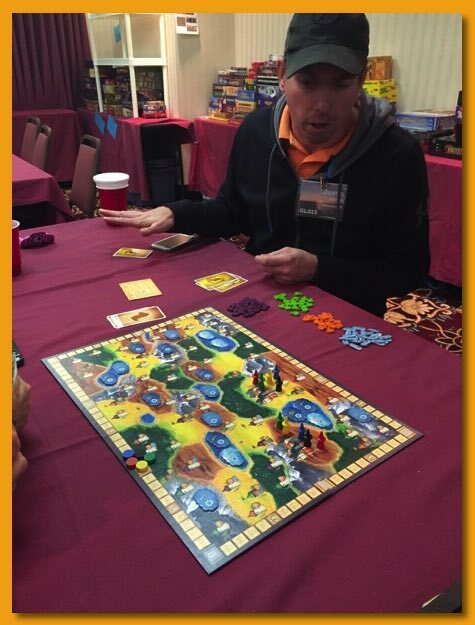 Next up was a new one to me called Kemet, an “Ameritrash”-stye game featuring lots of plastic bits and battling each other to earn victory points. It’s got some really nice aspects to it that keeps it in my wheelhouse as I’m don’t normally gravitate towards battle-heavy games. 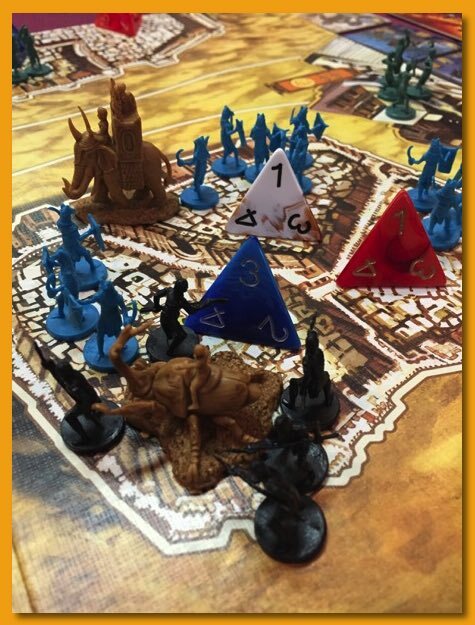 There is no dice-rolling for battle resolution instead relying on card-driven strength and bonuses. And, I have to come clean and admit that fighting with a giant protective, special-power eliminating snake at your side is kinda cool. This game of Ruhrschifffahrt was brutal. We had all the “no captain” tiles come out close together near the transition to the “white/blue” region and that killed the ability for us to make much progress. Normally this game is really enjoyable but this was a painful slog to the end. To close out the first night we played Broom Service a re-swizzling of Witches Brew from years past. 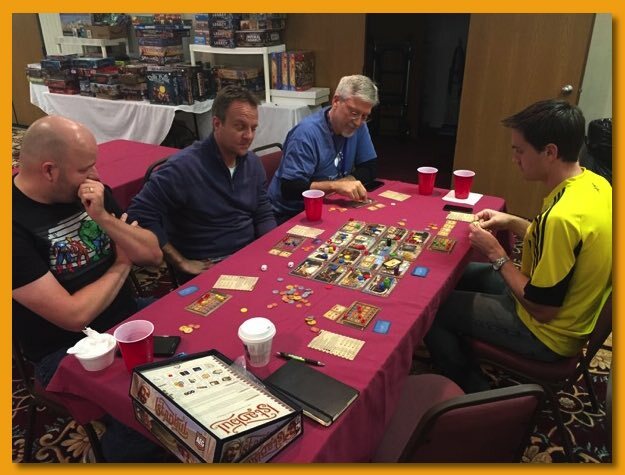 I wasn’t a fan of the original game but the addition of the board and the full compliment of players made it very enjoyable. Next, I sat down to a game of Viticulture/Tuscany. What a great game. I think I’d almost always be up for a game of it. Wine making at its best! I was a bit hesitant to sit down to Imperial Settlers after my epically long game with last time I played but we ripped through a game for three quickly and it was great. That experience brings the game back into consideration. You can hardly go wrong with Splendor. Another quick game that most everybody likes to play. Lots more people arriving now. This is almost as busy as it ever gets besides Saturday night after the prize table drawing. 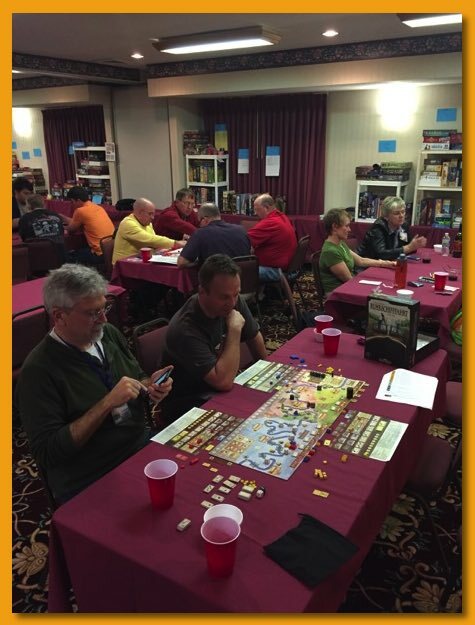 I jumped into the satellite room with a group of seven to play Between Two Cities. 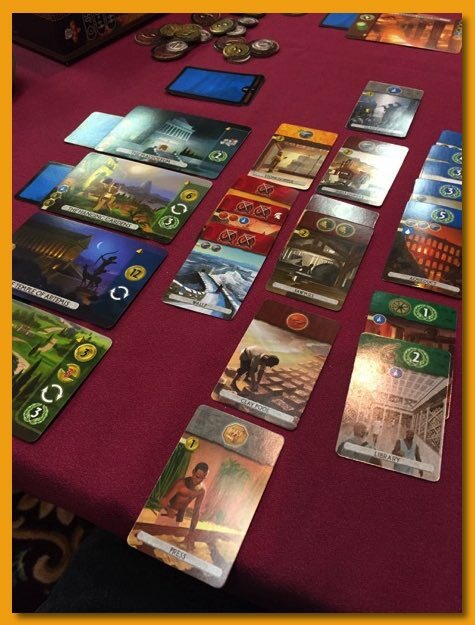 It has a 7-wonders style spin but without cards. 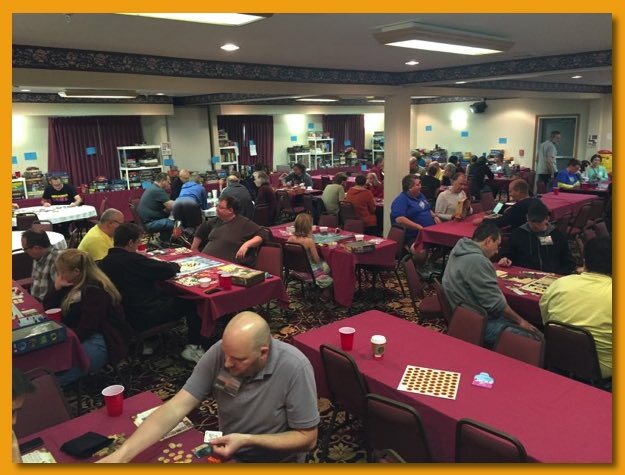 Players are drafting two tiles from a group, and then passing tiles to the left, then right, etc. 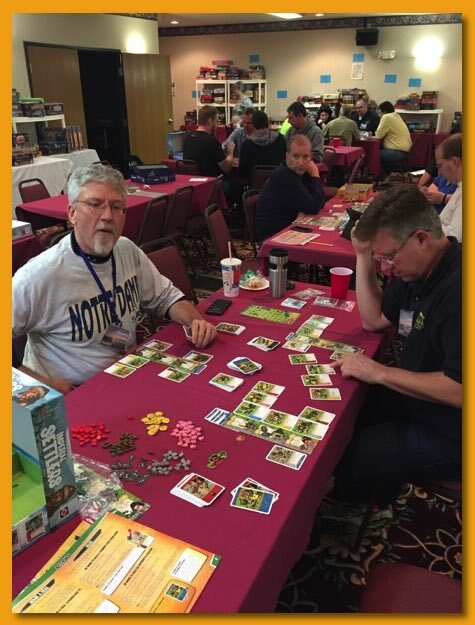 One of the two drafted tiles must be placed in the city you and your left partner are build and the other tile is placed in the city you’re building with your right hand partner. You score for how well the tiles are placed in comparison to numerous rules. You and your partners score the same number of points for your shared city and you want both cities to score as much as possible because your final score is the lowest score from each of your two cities. The game didn’t do it for me as it seems almost every game would come down to the tie-breaker. It’s just designed to be too tight. Next up was Code Names with eight (4 on a team). Party games aren’t normally my “thing” but it’s not a bad activity for a large group. 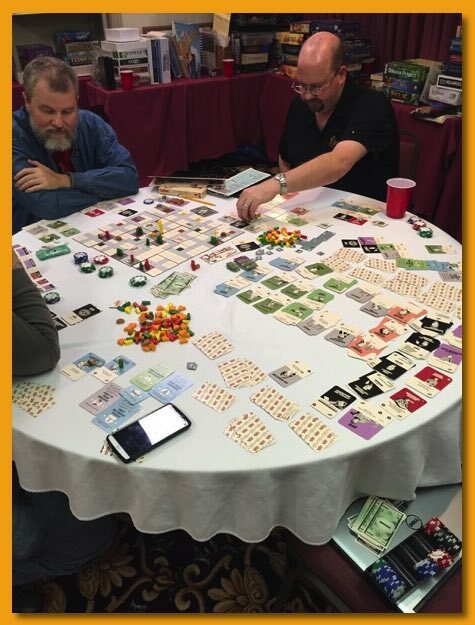 I just had to get a shot of a table playing Food Chain Magnate. Wow, what a huge footprint! 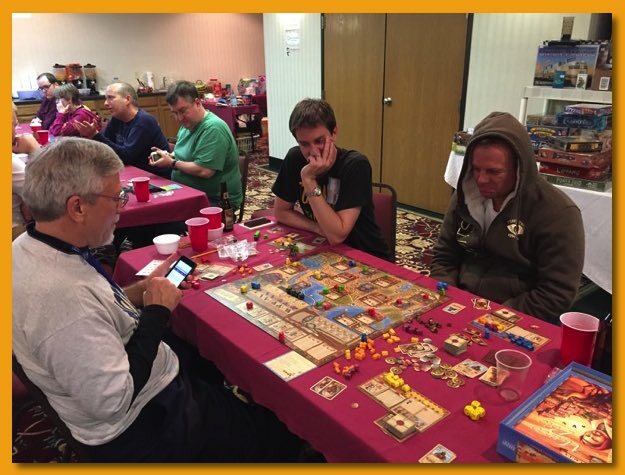 We had an attendee get us quickly up to speed on Marco Polo and we knocked that out in short order. There’s not much new to me here. Mostly try to take advantage of your special role/power, get stuff, and then use it to fulfill “contracts”. It was enjoyable enough but definitely not on my buy list. 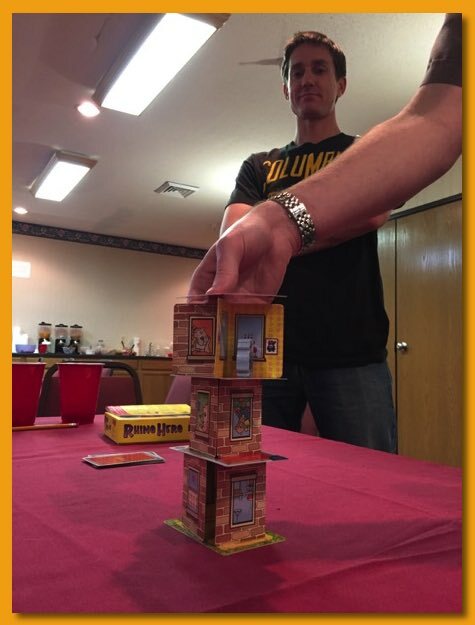 It started getting late on Friday so we broke out Rhino Hero a dexterity game of building a house of cards using a hand of cards with Uno-styled actions (e.g. skip, x2, etc.) People takes turns, the tower gets bigger, it falls, hilarity ensues. A perfect game to close the night. Wow my brain wasn’t firing on all cylinders when we played Istanbul. I felt like I was five turns behind everyone. I grabbed For Sale since a guy at the table had never played. It’s been years since I played and there’s a lot of fun packed in those fifteen minutes. 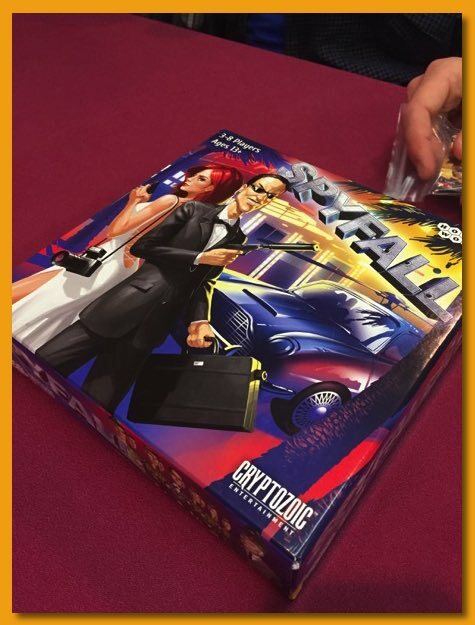 Next up was SpyFall. This one really fell flat with me. Maybe we were trying to game the game too much I can’t imagine trying to guess the location as the spy without knowing all of the possibilities by heart. 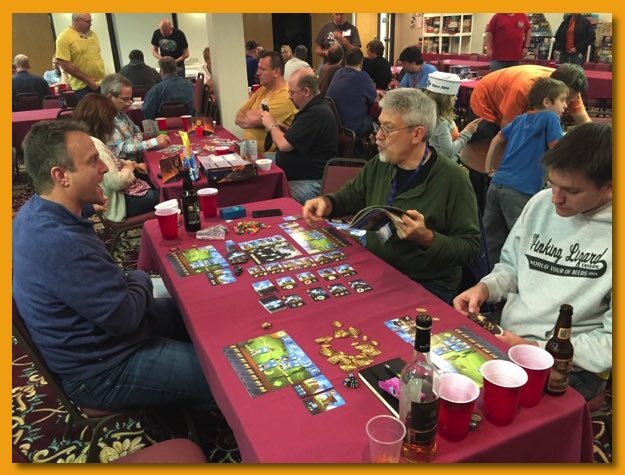 I pulled out Artifacts Inc. since it looked like something I’d like when I saw another group play it. 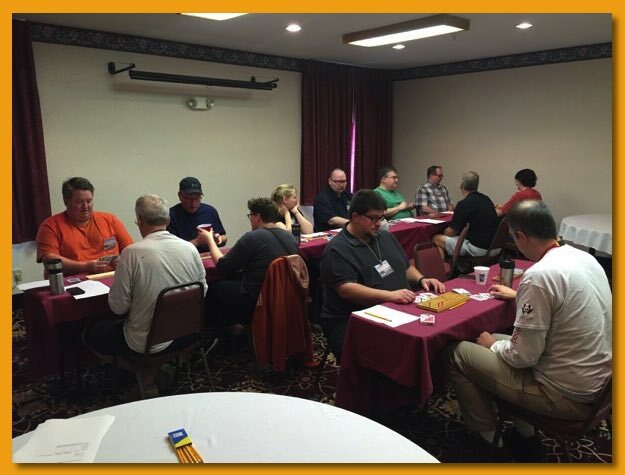 While others were finishing up a game I read through the rules and then jumped in to teach. We played with four which was a mistake as the down-time killed it for me. I think there’s a good game there but maybe only for two or maybe three players. 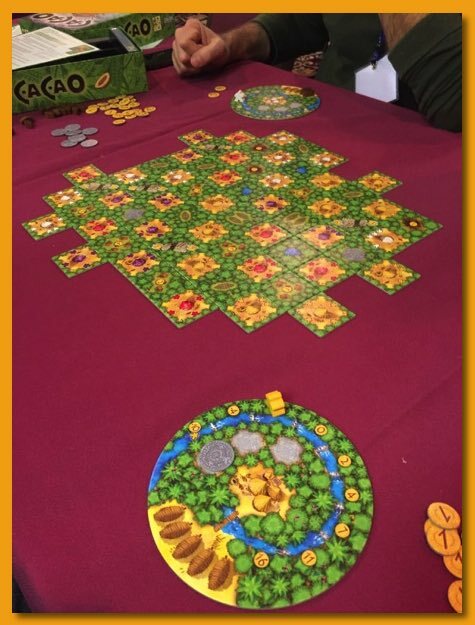 Next up was Cacao, a quick tile laying game that has a Carcassonne-ish feel but it’s certainly a different game. Players lay worker tiles from their own deck of tiles and fill in with “forest” tiles from a common deck when necessary to create this checkerboard pattern. Adjacent actions in the forest tiles are triggered with worker tiles allowing players to get stuff that can eventually turn into victory points. There are some end-game finagling but it borders on an activity/puzzle more than a game. Light fun but not something I feel the need to own. 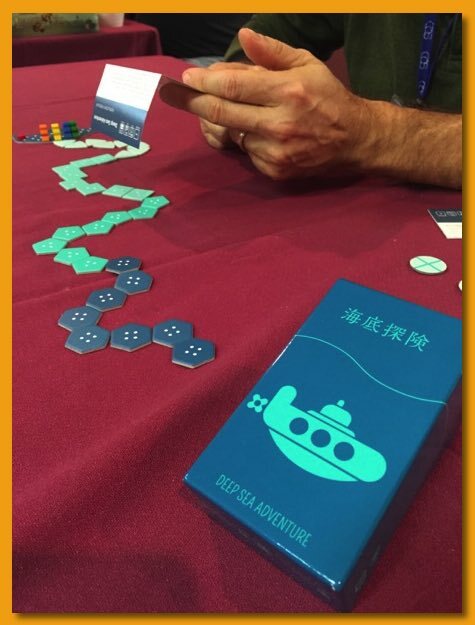 A member of my gaming group won a copy of Deep Sea Adventure from the prize table. What a fun little game of semi-cooperative diving to obtain treasure from the deep. There is a shared supply of air and players push their luck to dive out of the sub trying to grab the better deeper treasure while also trying to get back to the sub before the air runs out. If you don’t, you have to drop your treasure. Three rounds of quick fun. Next up was Above and Below. It was getting late and a couple of us just didn’t have it in us to finish it up. The other two wanted to keep playing and graciously kicked us out and kept going. It seemed fun with the story telling aspects but I just didn’t have the mental capacity to gut it out. Too much 12-year Glenmorangie was probably the reason. 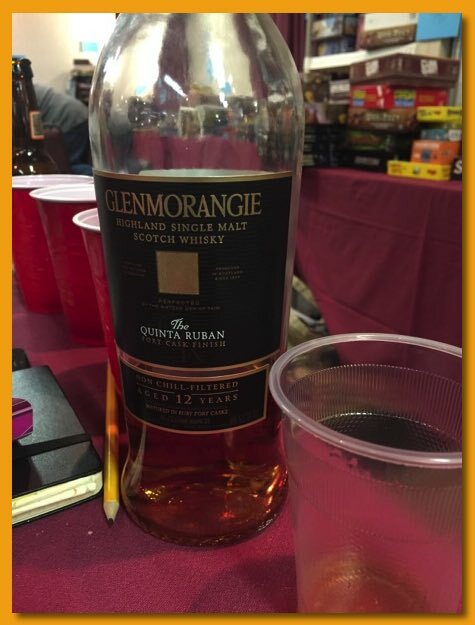 Later I realized I missed a great opportunity to play Glen More while sipping Glenmorangie. Ah, next year I have big plans. 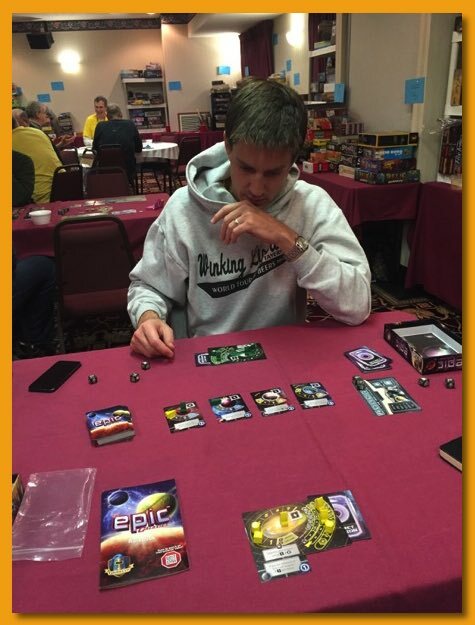 It was close to 1am but I taught a quick game of Tiny Epic Galaxy and then hit the sack. Sunday morning is a time to fit in a few lighter games and say goodbye to everyone. 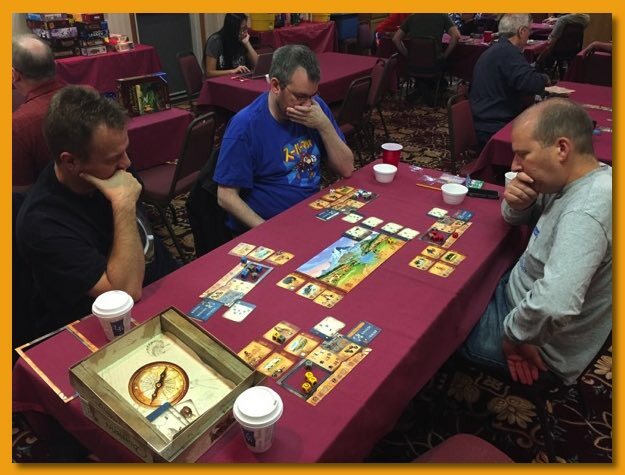 I usually don’t play much but I did crack the shrink on my prize table winner, Discoveries: The Journals of Lewis & Clark and immediately two people who’d played asked if I was looking to play. Hell, yes! What a great game! I’d played its big brother and this is really the better game. It’s much more stream-lined and there are dice to roll! What could go wrong with that! 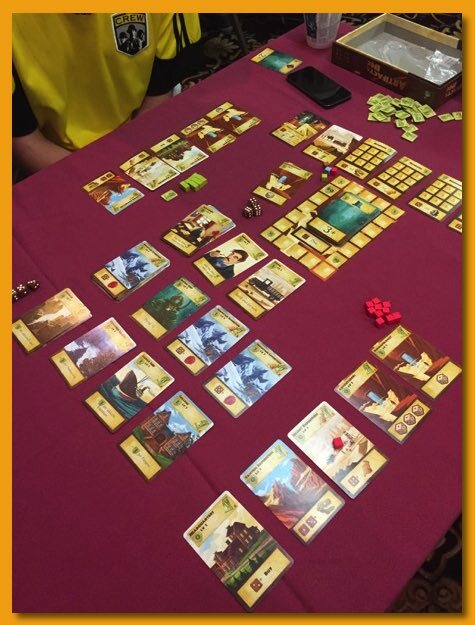 I finished up the convention with a two-player game: 7-Wonders Duel. 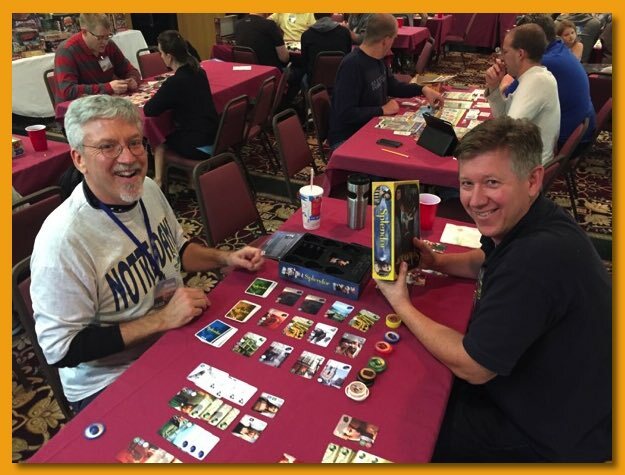 It certainly has the feel of 7-Wonders without all the fuss of sifting through cards for the right number of players. In fact you don’t even hold cards in your hand. The additional rules are easy to grasp and I’m on the edge about buying a copy but I’ll probably cave and order one. I slept 10 hours last night and was in kind of a daze at work today but I’d go again in an instant if I could. Ready for next year; bring it on!